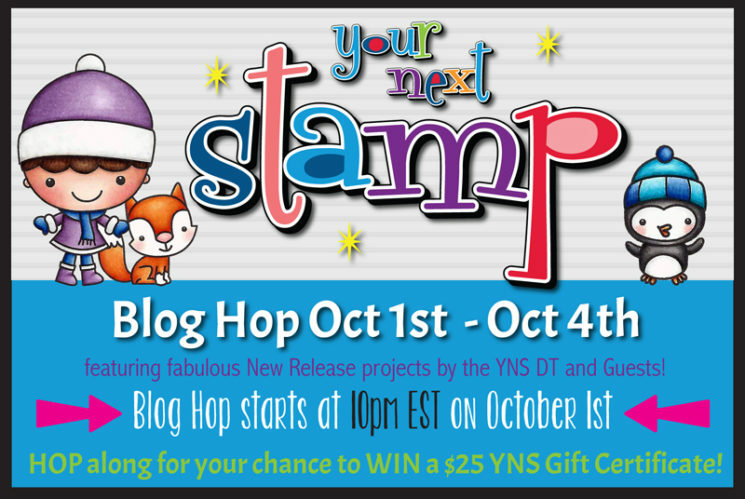 Hollybeary Creations : YNS Blog Hop!! It's time for the October Release from Your Next Stamp!! All the products from the release are now available in the store. I'm using the cute new sets.. Merry Christmas Chickie and Sending Joy. This release is full of so many cute sets it's hard to pick just one favorite.. And YNS now has their own line of inks!!! I watercolored the background using some Tumbled Glass Distress Ink and then I Heat embossed the sentiment using some Glittered Silver Embossing powder. I die cut the panel using the Stitched Rectangle Dies and Added some White paint Splatters. Then I adhered the panel to a White Card base. I stamped the images and colored them in with Distress Inks. Then I die cut them using the coordinating dies and adhered them with some foam tape. I wanted a little extra sparkle so I added some Clear Wink of Stella to the images and some Silver Tinsel Gumdrops. For my second card I used Sending Joy. I stamped the image onto some Watercolor paper and colored it in with Distress Markers. I die cut the image using the Stitched Ovals die set. I created a Vanilla Card base and added a piece of Pattern paper that I die cut with the Stitched Rectangle die set. Then I adhered the Oval image piece with some fun foam. I stamped the sentiment onto a coordinating piece of pattern paper in Olive Black ink and die cut the piece using the Fishtail/Banner die set. I adhered it to the lower edge of the card front. For an extra pop of red I added some of the Circus Fun Matte gumdrops. These are perfect for watercolor images. There's a great special going on in the store so grab your favorites from the Release and some other goodies. Are you ready to Hop along... Be sure to leave comments along the way for a chance to win a $25 GC to the store! Super cute cards Holly! Thanks so much for sharing! Great cards and really great release! fab job with these Miss Holly! Loving the gumdrops... makes me want to go pick up some!!! Cute, cute cards! Love this new release! Lovely. Looks like Im in need of these stamps!! Cute little critters...love your designs! These are so festive! Just love those little birdies and mice! Well, I'm a birdie lover so really adore those sweet chicks. And those mice are adorable - love your awesome card. I love the card with the mice playing in the wreath. the little chicks are darling. Loving the water colour background! Awesome cards! Hi Holly!! Your cards are both so cute!! 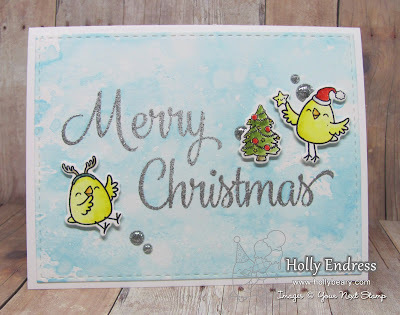 I love the distress ink background with the holiday chicks!! So adorable 😊 Thanks for the inspiration! those birds on the first card-so cute! What beautiful cards. Love those sweet chicks and the adorable mice wreath. Beautiful watercoloring and colors. Just love the new release. 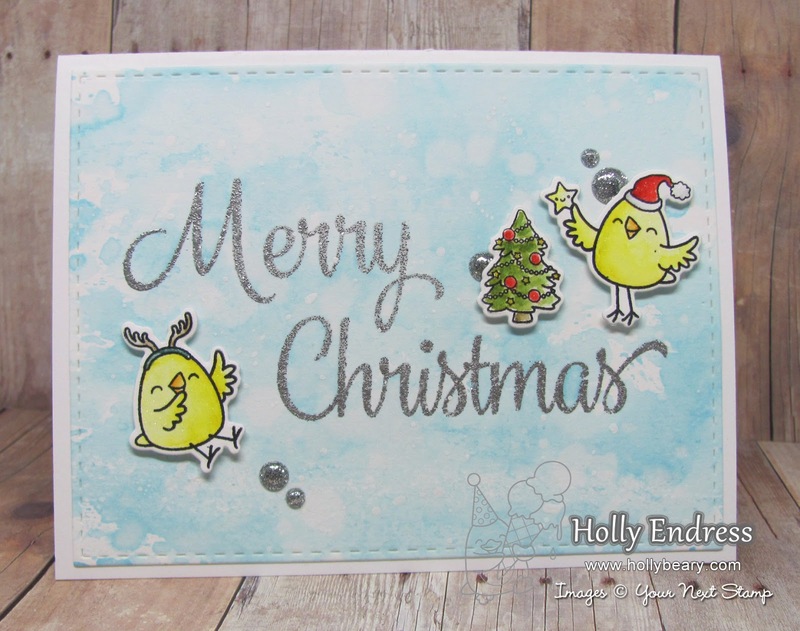 Both of your cards are gorgeous, your watercoloring of the images is fantastic and the blue background you created is so pretty with the yellow chicks! The leaf veins are absolutely gorgeous. YNS mice are cute! Both cards are adorable! I especially love your wreath and the sweet mice! Cute cards. Great new stamps and dies. I'm really loving the little mice set. I have seen two cards now and I really think I may need them. Such a cute and adorable set. Both cards are really cute!! Awww . . . these are both adorable! Cute cards! I am loving this release! I love the theme of these sweet little animals on holiday cards! Cute cards. I like the soft background on the first one and the coloring and plaid paper on the second. Sweet cards! Love the tree decorating chicks! Such sweet and delightful creations! Love them! Adorable cards and so fun! Adorable cards! The mice one is my favorite! Great cards love the chicks and the watercolor background! Both of your cards are super cute. Thank you for sharing. Sweet new release! very nice card. Thanks for sharing!